Friday, April 27, 2001 11:00 a.m. The District of Columbia Financial Responsibility and Management Assistance Authority ("the Authority") is very supportive of this effort by the District of Columbia Council to share factual information about the future of the District's publicly funded health care safety net services. I am Eugene Kinlow, a member of the Authority, and I am pleased to represent the Authority on behalf of Dr. Alice Rivlin. She regrets that she is unable to attend. So do I. The Authority has never participated in a Council hearing or roundtable. But it is very rare that the District Government has been prepared to consider the type of decision you are contemplating today. It is important that the Authority participate in your effort to ensure that as much information as possible is available to each member of this Council and to the residents of this community. (Because of this unique circumstance, the Authorities' presentation should not be considered as part of the panel representing the office of the Executive.) Everyone should have the opportunity to consider the relevant facts about this plan, the "DC Health Care Alliance", to reform the health care safety net. 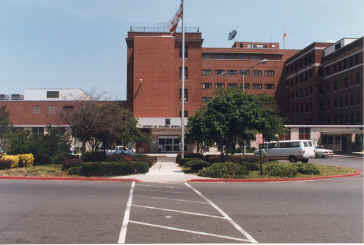 Unfortunately, and paraphrasing Dr. Rivlin, too many responsible officials have not been willing to face a very difficult reality: utilization at DC General has been shrinking, it is overstaffed, and financial and administrative management of the hospital and clinic operations have been very poor. And there is not an integrated comprehensive health care system. fussing over and fussing with patients about their health and their healthy and unhealthy behaviors. Referring them to specialty treatment when needed and to hospitals when appropriate. Scheduling them for follow ups. I recently received a letter from a local pediatrician who proposed that we build a small, comprehensive full service hospital at the DCGH site as the preferred solution. Sounds ok, except that that it's an oxymoron- -a hospital cannot be both small and comprehensive. And a small hospital is prohibitively expensive. During the first quarter of this fiscal year, The CFO informed us that the DCG would run out of money during the second quarter and face a shutdown. I am reminded of the famous malapropism: when you get to the fork in the road, take it. Therefore, last December, at the fork, the Authority insisted that the city act. As you know, the Mayor, the Authority, the PBC Board and this Council began this process last summer in a collaborative effort. The Authority's role through most of the process has been as an advisor and as a facilitator. It has taken on a larger role since January because the Council and the Mayor required the use of the Authority's resources and its procurement authority to address a critical problem when time was running out. Optimally, this process would not involve the Authority. Optimally, the District would have taken a year instead of a few months to develop and implement a plan. But the crisis at DC General Hospital has been a long time in the making. It was only in December that the Mayor and the Council reached a consensus and determined that the District would seek a partner to manage a private delivery system. As a consequence, there have been too few opportunities to ensure maximum public involvement. provide high quality health care services through an integrated health care delivery system with the capacity to serve 30 percent more health care while costing considerably less than any proposed alternative. The challenge to the Authority, the Office of the Mayor, and the Council, all of whom participated in the selection process, was to identify and test the capacity of a willing partner to undertake the commitment to work with the District to achieve these goals. We unanimously agreed that the proposal submitted by Greater Southeast Community Hospital best met this standard. funds an emergency room and clinics that will be maintained on the DC General campus. This proposed contract does not relieve the District of the burden of administering the safety net health care services traditionally provided by the Public Benefit Corporation. The proposed contract with the DC Health Care Alliance does, however, provide the financial, patients and other data necessary for the District to monitor the delivery system and outcomes while ensuring that providers are accountable. The proposed contract also protects District taxpayer. The contractor and the subcontractors receive payment only for services rendered. The District's resources are not transferred to the contractor under this proposed agreement. A third party dispersing went that will hold and release funds to pay administrative and patient service claims only upon notice that a service has been provided. This approach will protect the balance of the District's resources so that no creditor, court or even a public a agency can claim them. Finally, the District has the authority under the proposed contract to assign any part of this agreement to another party should the contractor or a subcontractor fail to perform. We all share some angst about Doctors Community Hosp. Corp. I know that it is counter intuitive, but our experience is that bankruptcies often lead to improved services and new viability. The city spends over 20 cents of every dollar it receives on Health yet we have horrendous health care statistics. We must spend these dollars more wisely before we spend more. In a city with an empty hospital bed for every two occupied beds and with much primary health care occurring in expensive emergency rooms, the debate about DCG is a distraction and must end. The shifting of our inpatient mentality to an outpatient/primary health mentality must begin. Your burden is not unlike that of any legislative body that faces a similar challenge in a community anywhere in this nation. Your consideration of this major reform plan is a difficult task for this community and therefore it is difficult for each of you. I now that it is your intention to undertake your deliberations with care, diligence and a respect for the facts and for those with whom you may disagree. The residents of this community deserve nothing less. Thank you.